Joe Satriani is sharing some new behind the scenes video discussing his inspiration behind the writing and recording of his new album "Unstoppable Momentum," which is now available. "This is what I do,” says Joe. “It's what I've always wanted to do ... in service of achieving that never finishing artistic quest - that's what it is and what it's all about." Satriani’s 14th studio album was recorded at Skywalker Sound in the Bay Area and produced by the guitarist and Mike Fraser (AC/DC). The album features Vinnie Colauita (Sting, Jeff Beck) on drums, Chris Chaney (Jane’s Addiction) on bass and Mike Keneally (Dethklok) on keyboards. 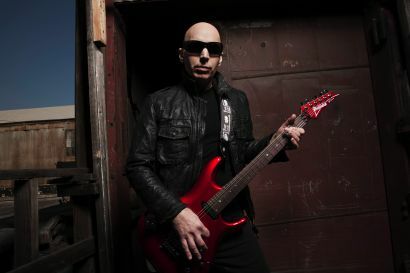 Satriani kicks off an extensive European tour on May 18 in Istanbul, Turkey; a North American trek starts August 29 in San Diego, CA.